What is your favorite Mexican dish? When it comes to Mexican night, there is no doubt that guacamole should be in the menu. Guacamole is so versatile that there is a million possible ways to make it. It can be very spicy or mild, chunky or mashed, and made with lots or little seasoning. I guess that the best guacamole is the one personally made by you, the one that represents yourself. As an experimental physicist, I do enjoy playing with flavors and see whether or not they will satisfy my palette. 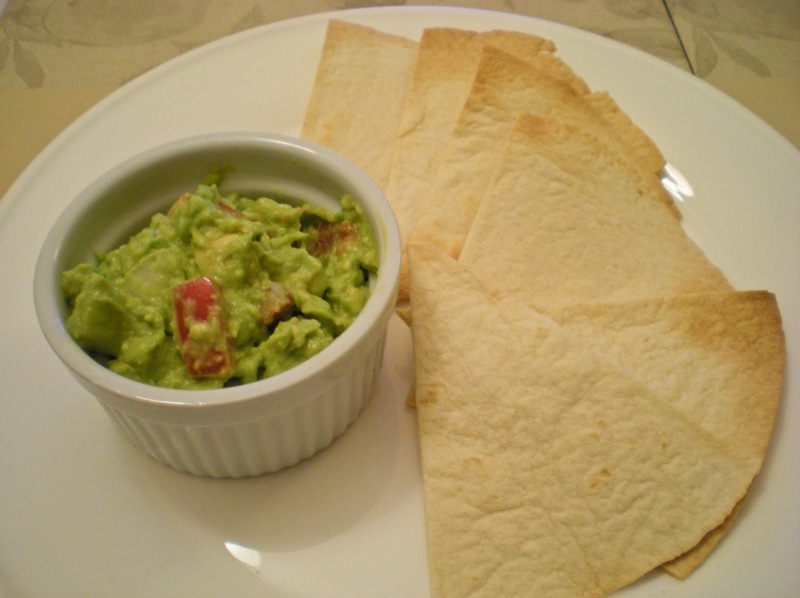 Guacamole is one of these dishes that it is almost impossible to mess up as no cooking is required. It is all about combining fresh ingredients. Here is some general facts to remember in making a good guacamole. Always use ripe avocados. For ripeness check, avocado will yield when a gentle squeeze is applied. If not ready, one can quickly ripen the avocados by wrapping it in aluminium foil and place it in a dry and warm/hot spot (Mexican trick). The process can vary between 1-2 days. Tomatoes are essential to provide a fresh and juicy taste. I personally prefer white onion as it yields lots of flavors without overpowering the other ingredients. I don't really like spicy food so no chili peppers are added. Finally, salt is the key to enhance all these flavors. For a healthier option, don't buy chips at your local supermarket, instead buy some flour tortillas and make your own homemade tortilla chips. Healthy and simple! 2. Line aluminum foil on a cookie sheet. Bake tortillas for 6-8 mins until golden brown and crispy. 3. Meanwhile, in a large bowl, combine avocados, tomatoes, white onion and lime juice. Mash it with a fork until desired texture. Add salt to taste. 4. Remove tortilla chips from the oven and cool for 1 min before serving. I love it, it's my favorite dip! I love guacamole and chips, the perfect snack. I can eat avocado plain, too, and often use it as a spread on my sandwich. Good stuff! Guacamole sounds delicious with that baked tortilla chips awesome starter. aww I've been missing guacamole a great deal ever since I left the States 2 years ago. Used to dip my chips into them while I couch potato myself to death. Thanks for sharing the recipe! This could be my favourite Mexican dish. Yummy! Looks really good. 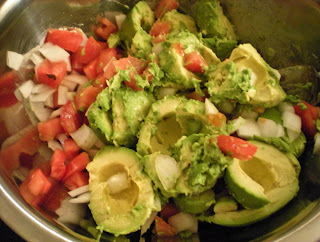 Have not tried making guacamole before, I suppose there is always a first time! I would however, add come chili to mine, I love spicy food. Thanks for sharing! I love guacamole and since I am making fajittas for supper; I will try your recipe; thank for your visit. Yum! 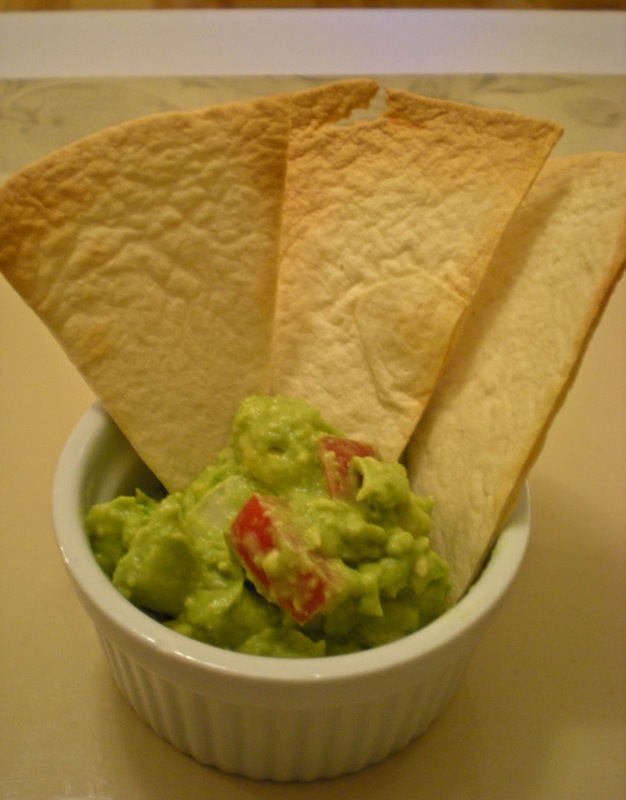 We're guacamole fanatics around here, we often have it as an appetizer. I personally like to use green onions, and I omit the tomatoes because I like my guacamole to be creamy instead of juicy - but then, everyone has their preferences. I also use cilantro. The homemade tortilla chips are such a healthy choice! Love the idea of baking the chips versus the traditional frying. Your guacamole looks fantastic! Happy Sunday! i love avocado dip. you know, the people over here tend to put the unripe mangoes in the rice bucket( cover them with the uncooked rice) for a few days, the mangoes will tend to ripe better and nice. Wow! Thanks everyone for all your comments and suggestions. @lena: The rice bucket sounds like a terrific idea. We usually put mangoes in a bag along with some fresh apples to accelerate the ripe process. I love guacamole and avocados are filled with the 'good' kind of fat. 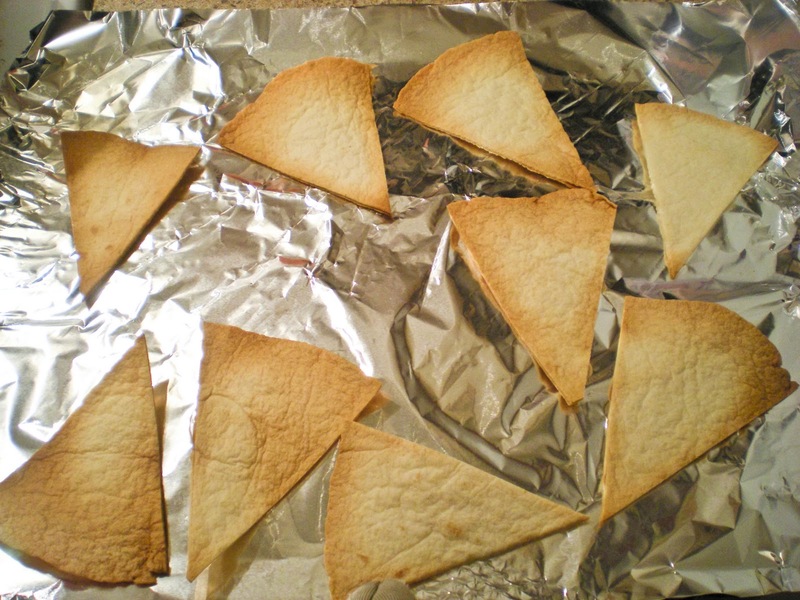 Great idea to bake your own tortilla chips. I'll have to try that!